Bow torque as measured in these tests refers to a rotation that is clockwise or counterclockwise about a vertical center line which is located at and tangent to the bows grip/handle. In simpler words, horizontal rotation of the bow in your hand. It is created by the bow, not the archer. 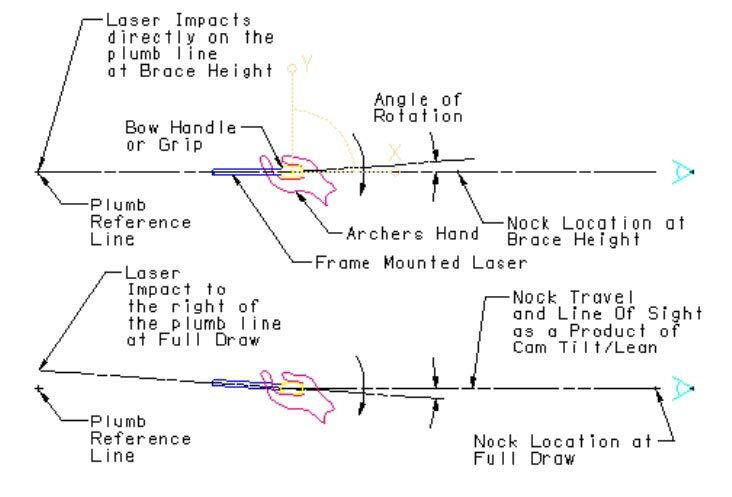 As you can see on the top drawing, when the test starts at approximate brace height,the laser will impact directly on the plumb reference line. The arrow would also point to that line. On the bottom drawing, the nocking point moves away from the cable offset system, this is caused by the cam(s) tilting as a result of the cable loads. This causes the bow’s frame mounted laser pointer to rotate to the right of plumb reference line with a right handed bow, and to the left with a left handed bow. The amount or amplitude of this deviation will vary on different bows. It will also be be greater as the draw weight is increased (all tests are done at 60#). There are various ways to mitigate this problem by design. Angled cable guard rods, flexing cable guards, wide limbs, wide limb spacing, shorter limbs, yoke systems, dual cams etc….OK you get it, it can be mitigated to a very large degree by design. If you look at all the videos you will see that some manufacturers have done just that with solid engineering. Some prefer to use hyperbole and glowing adjectives. You pick the one you prefer! The primary factor is allowing the cams to tilt more and more as the bow is drawn, control that and you have come a long way to solving the torque problem. Bow frames with the grip/handle that is located back towards the archer, these designs are usually done for speed increase but can be very sensitive to shoot without inducing more bow torque. Another factor are cable string yokes that are not adjusted properly so they induce even more limb twist and cam tilt and therefore more bow torque. As the bow wants to torque/twist in the archers hand more skill is required to not impede that rotation. If your bow grip stops or impedes that bow induced torque it will cause your arrow to impact the left (right hand archer) It can also cause some “fishtailing” flight aberrations, this will more apparent with a fixed blade broad head that wants to steer the arrow from the front before the arrows fletching can correct the flight. A bow that is very torque neutral will be easier to shoot consistently by all archers and especially so with fixed blade broad heads. The presence of bow torque may be overcome to a large degree by a skilled archer, but the absence of bow induced torque will create a bow that is very easy to shoot with consistent accuracy. 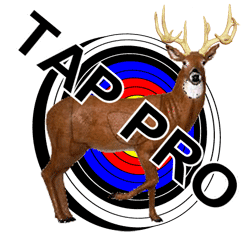 Bow manufactures should strive to deliver this level of performance to the archery community. 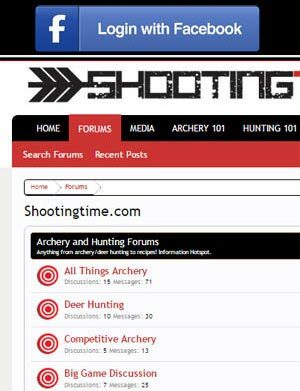 I hope these test videos and a better understanding of bow generated torque will improve your archery.